Hot summer days call for towers of ice cream, right? This adorable card Tatiana is perfect for a hot summer day! 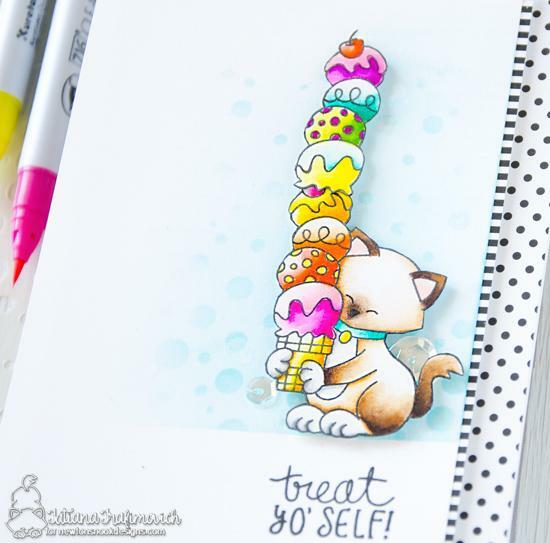 She used the image of the kitty and ice creams from our Newton’s Summer Treats Stamp Set. She colored the image and fussy cut it out. 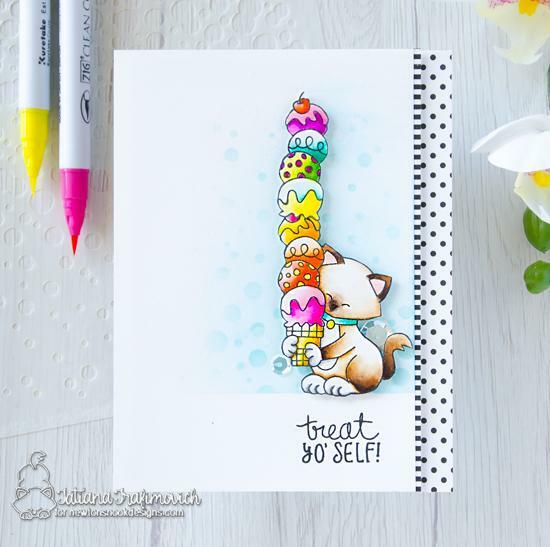 Then she stamped it a second time and colored and fussy cut out JUST the ice cream stack so she could add it onto the first image and create a tall tower of ice cream! What a fun idea! She just fun bright colors, coloring the image with Zig Clean Color Markers. For her card background, she added some soft bubbles using light blue ink with our Bubbly Stencil and layered the kitty image over that. She also added the "treat yo' Self" Sentiment from the Newton’s Summer Treats Stamp Set and a few sequins. The finishing touch is some black and white washi tape up the side! To see more details on her projects today and more of her beautiful creations you can visit Tatiana at Tatiana Craft and Art. A very cute, fun card. Love the coloring!!! Apologies for such late comment, fantastic fun card. Imagine the brain freeze after eating all that yummy I've cream.